The Analyze command displays the Analyze dialog box, which is used to create and run descriptive statistics using the currently opened spreadsheet. The results of each analysis are displayed in the Table dialog in a table format that may be copied to the clipboard or exported to a text file. 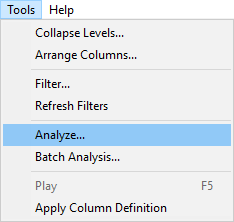 The Analyze dialog may be displayed using the Analyze command in the Tools menu, or by clicking the Analyze tool button. All statistics are calculated based on the filtered spreadsheet. Thus, only displayed data is included in the analysis. If a value cannot be calculated for an analysis, the table of results will display “N/A.” A value may not be able to be calculated if the variable contains all string data, or does not include a sufficient number of observations. If an observation did not occur in the analysis, the table will display a blank value.